Group Discounts: NYC Guided Tours, History, Culture, Art | All Tickets Inc.
All Tickets Inc., the leader in Broadway group discounts and comps, offers tours of NYC by fully licensed, trained and experienced multilingual tour guides. 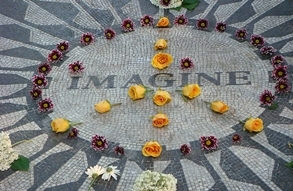 Add a tour at a group discount rate to you itinerary to enrich your NYC adventure. Along with expert guides, our group sales agents will book your group on a comfortable, well-equipped bus. Double-decker buses, open-top buses, climate controlled single-deckers and specialty buses are available. Here are some ideas on what you can do. The extreme hustle and bustle of Times Square seems to pulse through all of Manhattan. Here you’ll see the magnificent signage, ads and marketing campaigns; the glitz of the theatre; and the entire spectacle of what is the central artery of the City while discovering the inside scoop on what’s behind all the show and bravado of Times Square. The man credited with creating the modern Broadway theatre, George M. Cohan, is honored by a statue situated in this busy neighborhood. 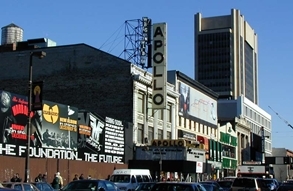 The historic Apollo Theatre in Harlem. With a rich artistic and cultural heritage and a diverse history, Harlem is popular with group tours. New trends in drama, art and music are part of present-day Harlem and also a major aspect of its history. Discover the groundbreaking Apollo Theatre, the historic site of the Cotton Club and the Studio Museum of Harlem. Journey to what was the center of NYC’s jazz and blues and the genesis of the Harlem Renaissance. Wall Street tours are popular. 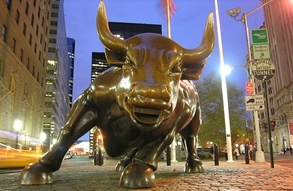 The financial center of the world is located in Wall Street. The NY Stock Exchange, Federal Hall (the original site of our national government) and Trinity Church are all a part of this informative tour of one of the busiest financial districts on Earth. See Trump Towers and other symbols to the massive fortunes made and lost on Wall Street. Over 25 million people visit the 800-acre park every year. It beckons to those who want to get away from it all. Central Park is an homage to beauty, as over 4 million forms of plant life representing 1,500 species may be found in this oasis of nature, art and human engineering. Enjoy the history, splendor and uniqueness of Central Park.